British Antarctic Survey Halley Research Station: Power went out at the South Pole. What’s the Worst Place to Be When the Power Goes Out? The South Pole. In winter. 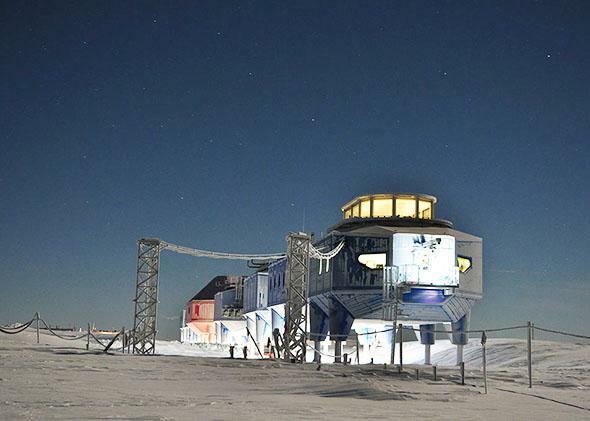 Halley VI Research Station in winter. Now imagine if the power went out. It’s winter at the South Pole, and last week the power went out at the Halley Research Station. Base commander John Eager tells Alison George how the team coped with the minus 55 degrees Celsius temperatures. She conducted this interview via email—one of the services that is still working on the base. You’re the base commander at Halley Research Station in Antarctica. Can you tell me a bit about the place? Halley is the most southerly research station operated by the British Antarctic Survey. It’s located on an ice shelf close to the sea. It’s been in use since 1956 and we mainly carry out atmospheric sciences, but also geology and glaciology—the ozone hole was discovered here. There are 13 of us wintering here at the moment. How cold is it out there right now? Temperatures are lower than usual—but I’m not sure if it’s a record. Temperatures have ranged between minus 30 degrees Celsius and minus 55 degrees Celsius, without accounting for wind chill. On July 30, a major technical issue resulted in the station losing its electrical and heating supply for 19 hours. It is too early to speculate on why the systems failed. Power, heating, and some services like the cooking ranges and email are back online. Some equipment will have got very cold and needs to be warmed up very slowly. All 13 station staff are safe and in good health, everyone is coping exceptionally well, and I’m in daily contact with colleagues in Cambridge. The team has definitely shown that they have what it takes to live and work in an Antarctic winter. How did you keep warm without power? An ancillary building has power and heat, there are plenty of warm clothes on station, we have alternative cooking facilities, and of course BAS always has contingency plans in place in case situations like this arise. What is the contingency plan if the power goes down again? Halley also has a summer-only facility, which is normally shut down for winter, but that is being made ready. Getting it up to temperature takes time. What does the power shutdown mean for the research that was being carried out? All research, apart from meteorological observations for weather forecasting, has been stopped. The director of science and senior scientists in Cambridge are reviewing what we should do next. Are you in total darkness right now? Yes, although the sun is due to appear above the horizon next week.